Abbott bombs in Syria before bombing in Canning. Announcing in a Canberra Press Conference today what he calls ‘a logical extension’ of Australia’s campaign in Iraq, Prime Minister Tony Abbott has committed his nation to joining the US in bombing ‘ISIS military targets’ inside the Syrian border in an illegal incursion into another sovereign nation’s air space, a nation embroiled in a brutal civil war, a nation of strategic significance in the Middle East which currently enjoys the support of Iran and Russia. It is a captain’s call, which Ayatollah Abbott makes once again, an authoritarian, arbitrary decision-making style he prefers to consulting his people or going through parliament, but one which he presents as consultative on the grounds that it has been discussed by his government’s national security committee, a rubber stamp of the executive. Abbott fools no-one. Proving that he will do anything to revive his political fortune, the most unpopular, least successful Prime Minister in Australian political history confirms also that he is happy to fly by the seat of his pants. 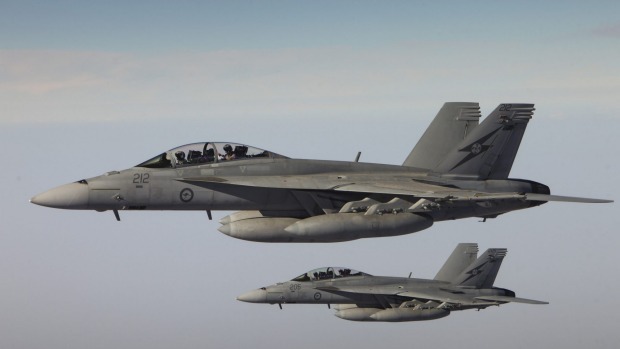 Abbott could articulate no specific objectives, in question today, yet he is keen to persuade the electorate, especially the people of Canning, that his commitment of Australia’s token strike force of six elderly Super Hornets is both a significant contribution to the war on ISIS and an insignificant extension to his party’s unswerving pro-US foreign policy. It is neither. The notion that Australia’s decision adds anything to the largely unsuccessful US bombing strategy is laughable. Even if Australia added another two of its antique aircraft in response to the US ‘tasking cycle’ as it was obscurely described by Head of Armed Force today it would be risible. The nation’s military deployment against ISIS, would remain that of a using pea shooter to halt a mad, charging water buffalo. Similarly, to present the PM’s decision as a logical extension of Australia’s current military commitment in Iraq is an attempt to hoodwink the nation; an evasion of its illegality and a down-playing of its significance in international law. It is a violation of national sovereignty. Yet is something which it suits the Abbott government to trivialise. Up until now the PM and the Foreign Minister has argued speciously that going into Syria is OK because ISIS disregards the border with Iraq. What does bombing achieve? Utterly underplayed is the point of bombing and its risks. The 6,500 strikes which the US coalition has completed so far have not halted the advance of ISIS. Most military experts concur that ISIS will not be stopped by this strategy, however, appealing it may be to a US which does not want to become embroiled in ‘boots on the ground’ warfare . In the Vietnam war the term collateral damage enjoyed currency as the deaths of ordinary innocent civilians, the destruction of normal everyday life was presented as an unfortunate by product of virtuous military campaigns. Today, the killing and maiming of innocent people should be seen for what it is an inevitable part of war, especially the preferred war in the air, the massive series of bombings which US has co-opted us into. Australia won’t make a bit of difference to the outcome. But today’s commitment may add a few points to the Abbott government’s polls at home. The bigger picture is no less distressing. Whatever short term bounce in the polls Abbott may enjoy, if indeed there is any bounce at all, the PM has helped commit Australia to a taxing and unwinnable conflict; taken another step towards becoming a part of another US military ‘solution’ to a complex, intractable uprising that will not yield to air force power. ISIS will not be stopped by bombing in Syria. The next step could well be a call for boots on the ground. Yet even if it is not drawn into another Afghanistan, Australia has aligned itself with the US against Iran and Russia in a conflict which it has no hope of either winning; no hope of easy retreat. Yet if ISIS needs confirmation of its propaganda that the US and the west is conspiring or colluding against it, for reasons of their own, Abbott’s announcement today is right on script. And if the voters in the rapidly approaching Canning by-election need any more evidence that the Liberals campaign is not ‘all about the people of Canning’ but is rather the last desperate act of a failed Prime Minister and an incompetent government, his declaration of war on ISIS in Syria, today indelibly fits the bill. « Shame on you, ABC, repeating Abbott government lies about Australia’s refugee intake.